My usually-lonely cup of tea has company this morning. I’m having strawberries for breakfast–they’re plump and bursting with the freshness of spring. This is a better start to the morning than I normally have (I rarely eat breakfast) and I can almost feel an extra skip in my step. My raspberry jam-glazed strawberries are resting on top of strawberry purée, are enveloped in a golden, flaky crust and topped with whipped cream. Not exactly a breakfast of champions but I certainly feel like a champ for how well these mini-pies came together. This is the closest I have ever come to making a pie–it hardly counts, I know. I used my favorite sweet pastry crust and no additional oven time was required after I baked the shell. Still, it’s a pie. Baby steps. 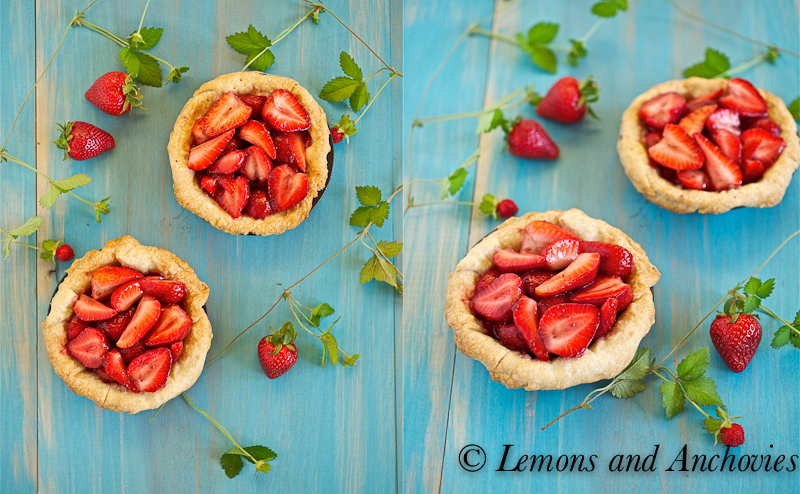 I split my dough in half and made only two mini-pies but I already know where the rest of my strawberries will end up. This dessert is only subtly sweet so the whipped cream helps to bring everything together. 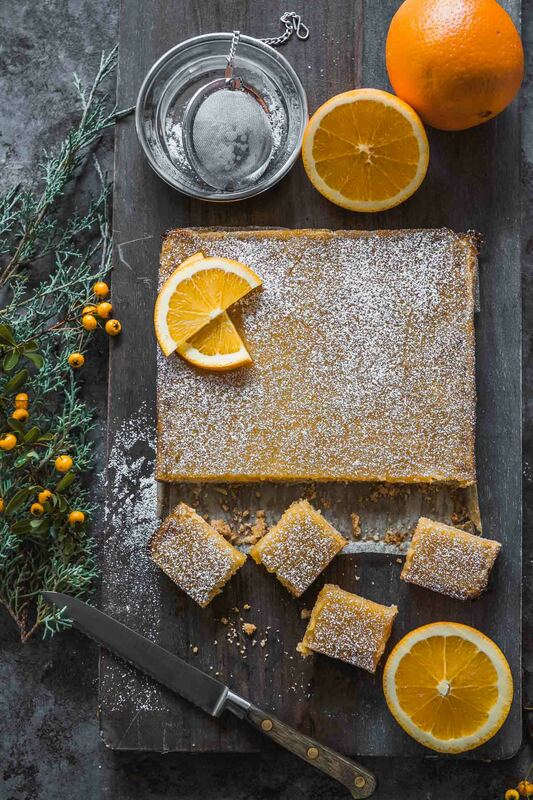 Now excuse me while I polish off the rest of this pie–good thing it’s a mini! 1. I’ve still got my Edgeware Ceramic Edge Gourmet Knife/Scissors Sharpener giveaway going on. It’s a $150 value and it works great. Please click here to enter. 2. I’m also participating in a Le Creuset photo contest on Pinterest for a chance to win a Le Creuset cookware set to give away on the blog. If you would like to vote for me by “liking” my image, please click here. Thank you so much! To prepare the pie shell: Combine all the dough ingredients above except the water and process in a food processor for about 10 seconds until the mixture is the texture of coarse crumbs (or the size of peas). Add the cold water and pulse 6-8 times, just until the dough begins to come together. Do not let it form into a ball. Transfer the dough onto waxed paper or plastic wrap and form into a disk. Chill in the refrigerator for at least 3 hours before using. Once the dough has chilled, Preheat your oven to 400 degrees F. Roll out the dough on a lightly-floured surface. Transfer to a 9-inch pie pan, prick the surface with a fork, cover with wax paper and weigh down with pie weights (or rice or beans). Bake for about 8-10 minutes until it begins to color. Remove the pie weights and wax paper and continue to bake until golden, another 3-4 minutes. Remove from oven and let cool to room temperature. Meanwhile, prepare the strawberry purée. Process 2½ cups of the berries in a food processor until smooth, about a minute. Strain the purée using a mesh strainer into a small sauce pan. Whisk together the corn starch, sugar, and salt in a separate bowl and whisk the mixture into the strawberry purée. Bring this to a boil over medium heat, stirring constantly. When the mixture is consistency of pudding, remove from heat, stir in the lemon juice and set aside to cool slightly. To prepare the glazed strawberries (I chopped mine in smaller pieces), melt the preserves on the stove or in the microwave. When fully melted, stir the preserves gently into the remaining strawberries. Assembly: Pour the purée onto the cooled crust then arrange the glazed strawberries on top. Wrap with plastic wrap and chill for at least 3 hours before serving. Serve topped with whipped cream. These are so adorable and they look so delicious! How perfect for spring, a simple way to showcase the berries at their best :)! These pies are so pretty, Jean! 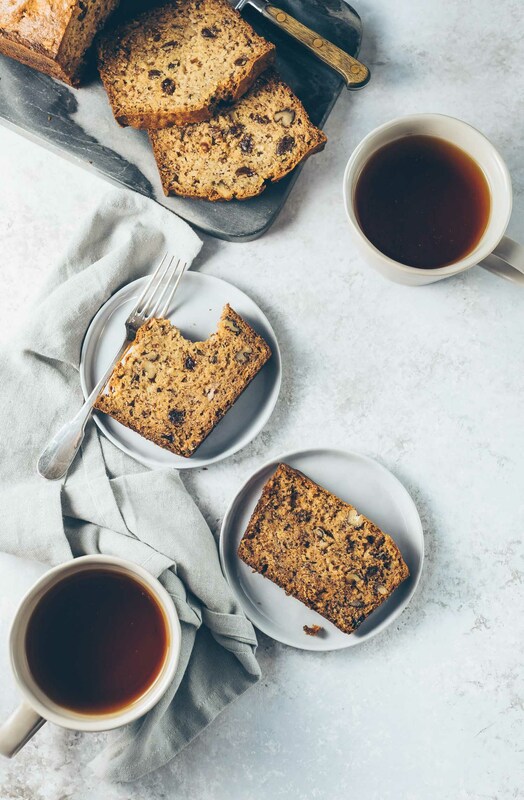 What a lovely breakfast for a beautiful Monday morning – have a wonderful day! Aw, they are so cute! I love homemade fruit pies like this, especially simple ones that highlight the freshness of the fruit. Individual pies?! Yesssss please….where is my fork? These look wonderful! I love fresh strawberries, I can’t wait to go pick them again this year. 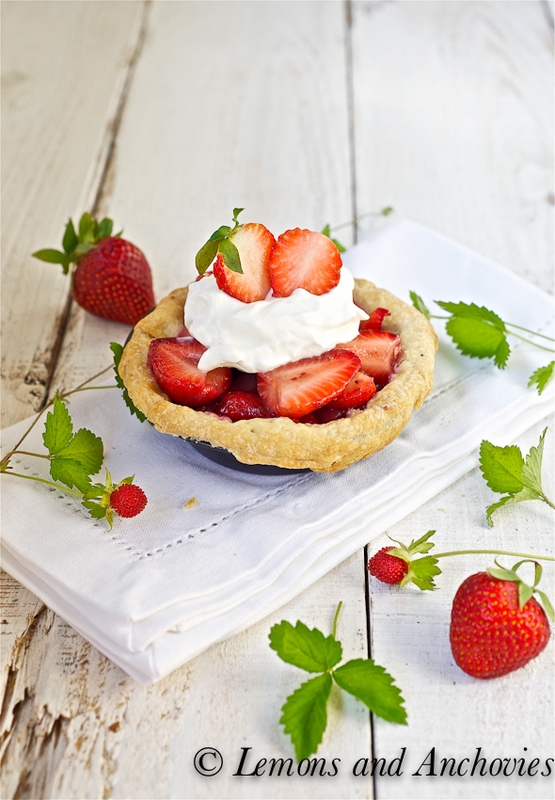 Strawberry pie is one of my favorites, but hubby isn’t a big pie fan, so this is perfect! Oh these are just too cute. They look fantastic and those photos are just perfect. I love your blue board. Mind if I get the other mini pie? I’m not a breakfast person either, unless there’s something that really perks my interest like this one. How lucky that you have wild strawberries in your own backyard! Gorgeous!! These mini pies are too cute to resist! Those are so cute, and I must say very delicious looking pies, Jean! Great photo shots…. Oh, boy, do these look amazing!!! Love how they are just full of delicious berry flavor…perfectly done!!! Nice job on the mini pies, I have been saying I’m going to make strawberry pie for weeks no so it’s time I do! 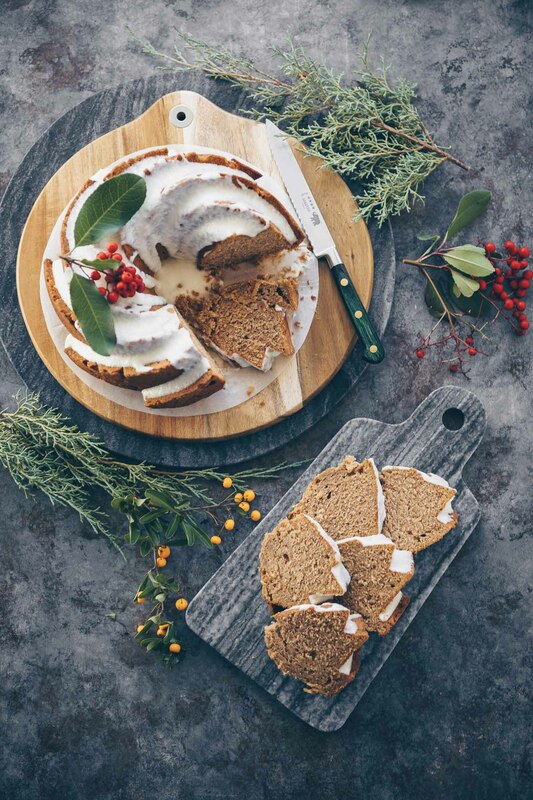 Pretty photos as usual making me want to eat them even more. You make irresistible food all the time, Jean! This year I haven’t made any pies or tarts with Strawberry yet. After seeing everyone’s desserts, I’m very much intrigued to try something. By the way I love the blue color on your board… I can look at the color endlessly. Gorgeous post! I love strawberry. I am that little girl praying for Springtime to come earlier this year…This will be the perfect companion of my morning cup. I specially love pretty treats for breakfast. A must try! Jean – love the blue background against the brilliant red of the berries! The wild strawberries are adorable. I bet you enjoyed each and every bite of these delightful little treats. Just perfect! Have a great week!!!! Oh, Jean…these are purrrrr-fect for breakfast! i’ll eat this any time of the day! they look terrific and i bet they taste that way, too! 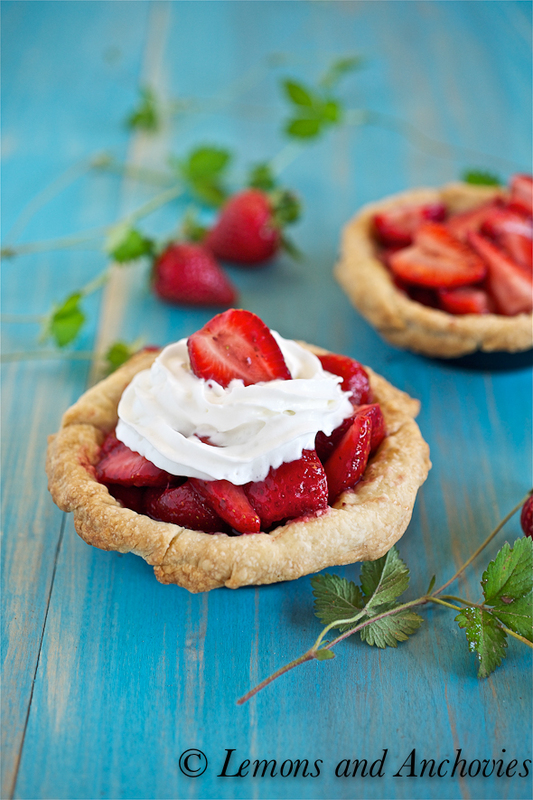 strawberries and cream and pie crust? SOLD! 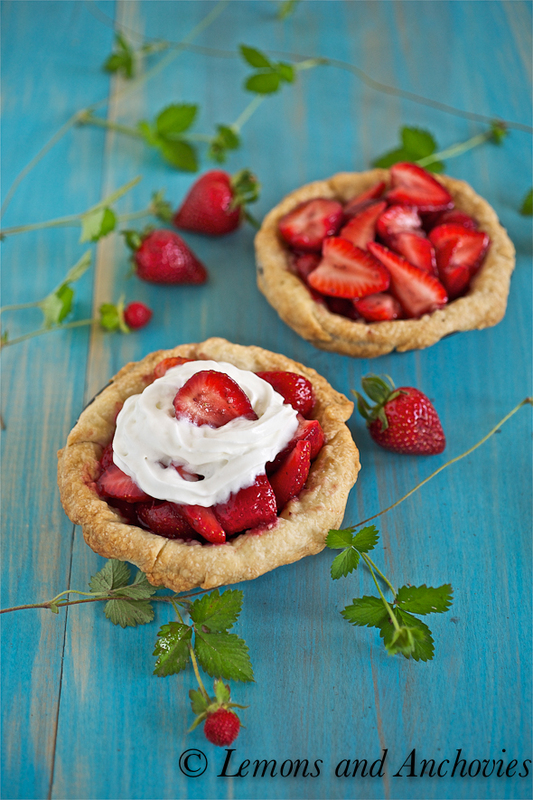 Adorable mini strawberry pies! Our strawberry season has just begun and I have been searching for recipes that have intense berry flavor, just perfect. The berry filling is is a stellar alternative to pastry cream. Freaking GORGEOUS! Would it be bad if I stuffed like 4 of these all at once into my mouth? Because I really think I could do it. What beautiful mini-pies! And wild berries? I’m so envious! These little guys are just beautiful!! And your photos are stunning. I purchased a few mini pie dishes last year, but I haven’t actually used them yet. My son would be all over this one! I try to eat breakfast every day, but, boy, how I wish my breakfast was so pretty! Jean these are just gorgeous!! And what a wonderful breakfast treat 😀 I’d certainly have a skip in my step if I had these for breakfast too. Gorgeous! These look like perfection. I made this for mother’s day and it was a hit with mothers, fathers, and daughters alike. Thanks! Wow, this is stunning. I say it really IS the breakfast of champions! I agree with Liren, it really is the breakfast of champions. I could eat this every morning 🙂 The strawberries you found in your yard are so cute. Great recipe Jean! I like the mix of the berries and don’t red berries look so wonderful against blue backdrops? Pie for breakfast is okay by me. I am allergic to strawberries, but aside from that I would have no trouble eating this everyday for breakfast 🙂 Gorgeous pies!